Like that poeticized beast whose time has come round again, so slouches another Arkham-based game toward your local retailer. Many gamers have asked just how often Fantasy Flight Games can dig into that cyclopean well of Mythos and mystery. Luckily for us Lovecraftian fiends, with Elder Sign the well has not yet been tapped. And yet, despite the gritty goodness that lurks within, from the moment I cracked the box I knew that the loss of sanity would be inevitable. For contained within this eldritch vessel lie dice – lots and lots of dice. Specialty dice, actually, with strange symbols etched into their glimmering surfaces; symbols that – for want of a more apt description – continued to taunt me at every turn and on every roll. Yes, this time around, Arkham’s fate is sealed all in the roll of a die. Judging by the name of this blog you might think I would not consider that entirely a good thing, but on the contrary it is the brooding atmosphere, tight mechanics and tense rolls that breath fresh air into the realm of these dusty tomes. Like its bigger brother, Arkham Horror, Elder Sign delves into the realm of H.P. Lovecraft, with horrific beasts that prowl the night, scheming cultists that seek to awaken an ancient evil, and star-born gods that seek to rule the world once again. That realm is no less vast in character in Elder Sign, even though the flavor is more condensed. For those veterans of Arkham Horror, there are lots of familiar faces, places, and things present here – but not so much that those less familiar with the streets of Arkham, Mass. might feel lost. We’ll come back to those faces, places and things in a bit, but for now, let’s turn our attention to the dice. 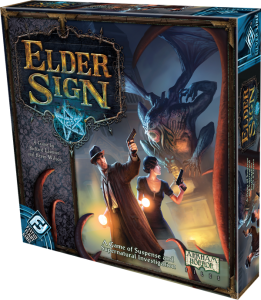 In Elder Sign, the players strive to protect the world from the coming of a Great Old One, like Cthulhu or Nyarlethotep. To do this, they must work together to collect a certain number of Elder signs – ancient symbols that have vast warding powers – by completing tasks during Adventures within the Museum and Other Worlds beyond. 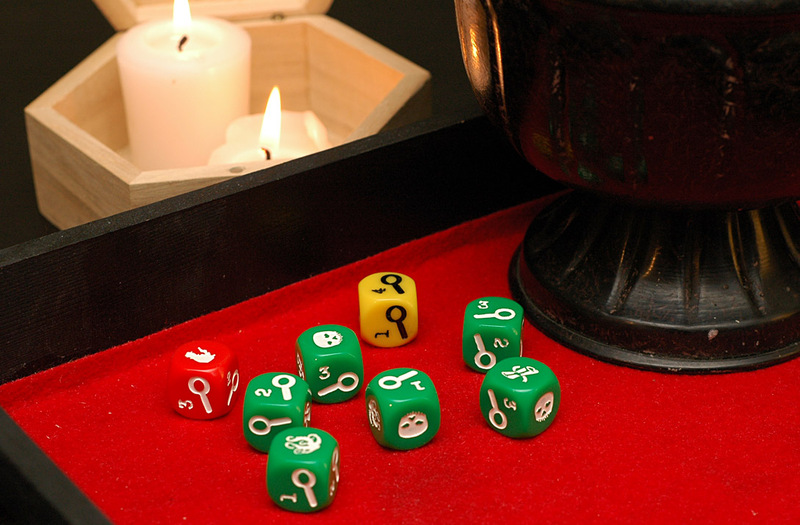 To complete these tasks, players roll a set of six base green dice with the various symbols of Investigation, Lore, Peril and Terror on their six faces, choosing carefully which dice to use for each individual task after each roll. If players are able to match the right dice in the right combinations, they succeed on their Adventure and collect rewards such as weapons, ancient tomes, spells, or the great Elder signs. If they fail, their characters will lose precious Sanity and Stamina, drawing them closer to being devoured by a denizen of the dark. Players are also able – through the use of items, spells and special abilities – to add a yellow and/or red die to their dice pool for a particular Adventure. Both the yellow and red die help players to accomplish Adventures that require a higher level of Investigation. The powerful red die also has a symbol that can act as any symbol in the game, which definitely comes in handy when your luck is running thin. Elder Sign is filled with tons of tactical choices during each game. 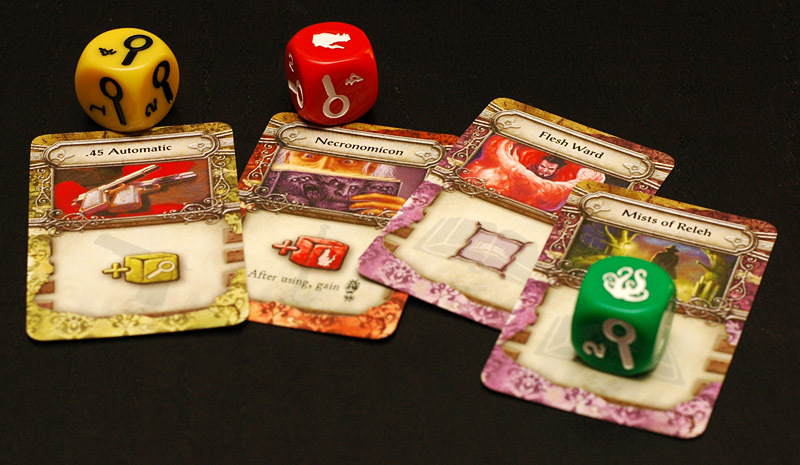 Each character has a special ability that may be more useful during certain Adventures, so deciding where best to spread your personnel is extremely important, as is when to use Common Items (most likely to add the yellow die to the roll), Unique Items (again, for the red die), Spells (usually to store a pre-rolled die result to help offset the luck of the dice), and Allies (citizens and such that can help in various ways). There are even oft-maddening decisions to be made during the dice rolls; choose the wrong die to use at the wrong time for a task, and you are likely to find yourself falling one step closer to death, insanity, or both! I never knew the Administrative Office could be so evil. 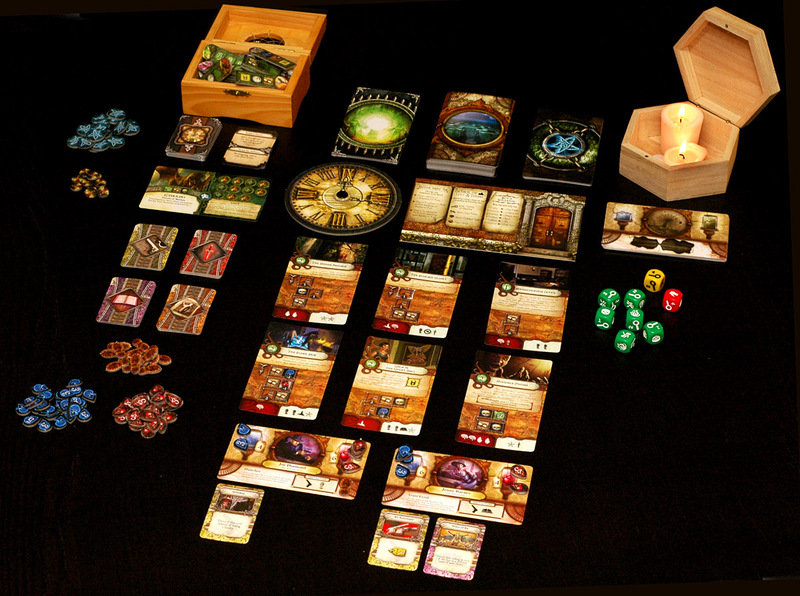 Each Adventure has its own set of perils and pitfalls, as well as its rewards and punishments; some players may decide to send their characters after Clue Tokens, which allow a re-roll of the dice, or go straight for the toughest Adventures which often net Elder signs – and, more often than not, Monsters that prowl the halls of the Museum, and Doom Tokens that, if enough are added, herald the arrival of the Great Old One – and probably humanity’s destruction. 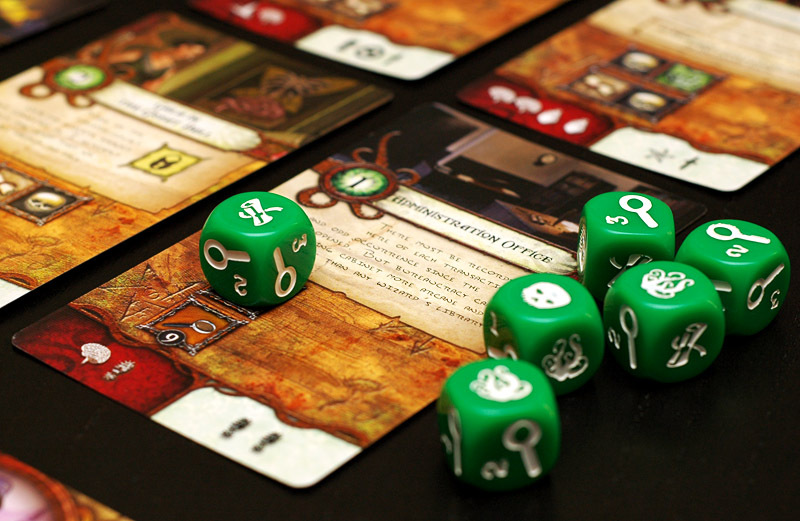 The injection of theme through the Adventure cards and dice roll mechanics is often what makes Elder Sign a special gaming experience. For instance, when an investigator fails a task, they must discard a die before again attempting that task – however, they may also choose one die to store on their player token without changing the facing. This is known as Focusing, and represents the character truly concentrating on what it is they’re trying to do. Other player characters that are in the same location may also Assist, storing one die on their player token. To me, this is a very simple and elegant way to represent the investigative and cooperative spirit that is present throughout modern gaming tales of the Mythos. Eat my twin .45s, dice karma. Returning to the aforementioned faces, places and things, Elder Sign includes characters that are long-familiar to Arkham Horror fans, and re-implements their legendary abilities in a unique way that fits well with the mechanics. For instance, Kate Winthrop and her ever-handy Flux Stabilizer are back, warding off Monsters, P.I. Joe Diamond and his penchant for getting the most out of Clues with double die re-rolls, and the ever-resourceful Ashcan Pete, complete with his canine sidekick, Duke, which helps him to avoid the negative effects of failed Adventures. These characters can often be equipped with the Dread Curse of Azathoth (which allows you to store two dice! ), the Tommy Gun (use both the yellow and red die), and, of course, the Necronomicon (gain the red die AND a Clue Token!). Characters may also find themselves in peril across multiple Other Worlds such as The Abyss and R’lyeh, and fighting old foes like Cultists, Dark Young, Cthonians, and even Great Cthulhu, himself. There can be no good without the bad. Elder Sign may be all about the dice, but even with bad dice karma, it’s possible to pull out a win with a good mix of Adventure cards, some wise tactics, and intelligent use of complementary investigators. However, there will be times when the dice seem to be controlled by some ancient eldritch power from beyond time and space, and they will stop at nothing to rend your soul. In one game, I tried to complete the same high-Investigation Adventure (that only counted as a level 1 Trophy, mind you) over six times, and that was with photographer Darrell Simmons whose specialty IS investigation. With its relatively-short duration, inexpensive price tag, and accoutrement-thin (by FFG’s standards) table presence, many have dubbed Elder Sign as “Arkham Horror Lite.” There is a kernel of truth in that nomenclature, but Elder Sign deserves to serve as a complement to Arkham Horror rather than a shorter, somewhat-easier substitute. 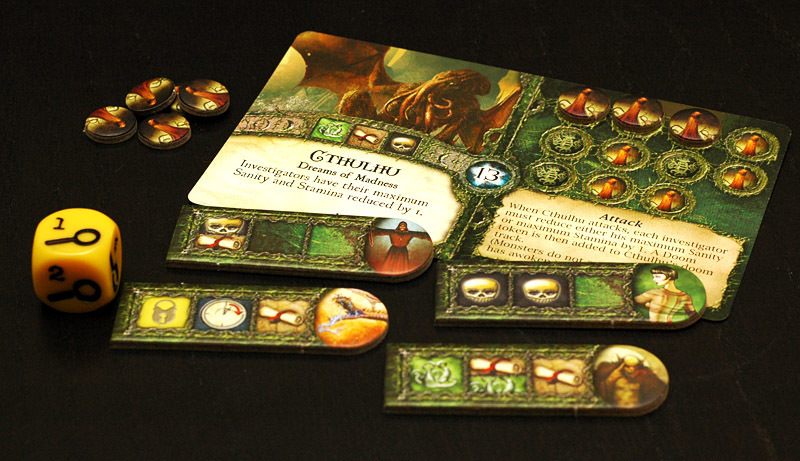 The rich narrative that is often weaved throughout a game of Arkham Horror may not be as ever-present in Elder Sign, but the tightly-integrated theme and dice mechanics allow those players with a good gaming spirit and a healthy imagination to enjoy just as satisfying an experience – all without the sometimes sanity-sapping playing time. There’s already been mention of the nice dice mechanics that Richard Launius and Kevin Wilson have worked into Elder Sign, but it’s important to note again that its elegant simplicity allows for excellent variety, challenge and immersion. As for replay, with the great number of Adventure, Character, Ancient One, Other World, Spell, Ally and Item cards included with the game, players won’t find themselves playing the same game twice for a very, very long time. In regards to challenge as part of replay, there has been some grumbling from many a gamer that Elder Sign may be too easy; I’m here to tell you that, unless you routinely win thousands playing Craps, this game is decidedly not. I will concede that the game’s difficulty skews a bit with four or more players; however, as a two-player game, Monkey238 and I have found few more rewarding. Elder Sign also excels as a solo game, whether controlling multiple characters or just one. And for those claiming that the game is too easy, I’d recommend trying to stop an Ancient One with just one, lone hero - guaranteed brutality. As expected from Fantasy Flight, Elder Sign has fantastic production values and gorgeous art and design. However, a recent unfortunate expectation from Fantasy Flight is also poor copy editing and lackluster rules organization, and Elder Sign suffers from that, as well. Thankfully, the theme has been expertly woven throughout the game, from the flavor text on the Adventure and Other World cards, to the tiny graphic details that tie the dice, the components and the Arkham universe tightly together. Even though I routinely get smashed by dice, I can’t help but find rolling them to be fun, despite the fear. The satisfying feel of cubes in the hand must be hardwired into gamers’ DNA. However, without a complete set of masterful mechanics and a thematic world in which to use them, dice can often get dull. I can safely say that Elder Sign is rarely dull. There is tension in every single task, alleviated only sporadically by the triumphant yawp of a wild, lucky roll. High fives abound; curses even more so. This is the essence of fun, and, in some sense, the essence of Lovecraft - to face that which you fear and succumb to passion in madness. Overall score: 15 out of 18 - You can feel it clawing at you, somewhere in the back of your mind. Don't resist. Heed the call... of Cthulhu. Elder Sign is a game for 1 to 8 investigators, ages 8 and up, by Richard Launius and Kevin Wilson for Fantasy Flight Games. It retails for $23 at Boardgameguy.com, or you can ask for it at your favorite local game store. One of the things I like about Elder Sign over many of the other dice games on the market is that I feel more engaged during the down time. You’re rooting for each other to roll well or possibly take care of threats that affect you directly so there is less anticipation waiting for your turn. Steve – I totally agree. It’s like that a bit in Arkham Horror, as well, whether it’s just listening to the story or watching someone beat up on a monster. Still, Elder Sign is that experienced condensed, so each player anticipates every single roll. Love this detailed and atmospheric review–you’ve convinced me that I need to slouch towards Bethlehem, or my local FLGS, and buy this game! Alf – Thanks! And don’t forget to save money for another great game coming in October – The Road to Canterbury. Thanks for the review, Chris. You nailed the two-player appeal dead on; the GF and I are really digging it. Oh, I so want to play this! Your overview was fun. As Alf said, it was atmospheric and I think I will like the dice mechanic. Thanks for the review and I’m hoping for a play soon. Thanks for the entertaining but thorough review. I have Arkham Horror but it doesn’t hit the table much due to the time investment. I’m hoping Elder Sign could scratch my mythos itch as a filler. My investigation continues, but your review has nudged me closer towards an educated decision. Even more fun on the iPad with sound effects!